Like bourbon? And champagne? Then we’ve got just the drink for you. 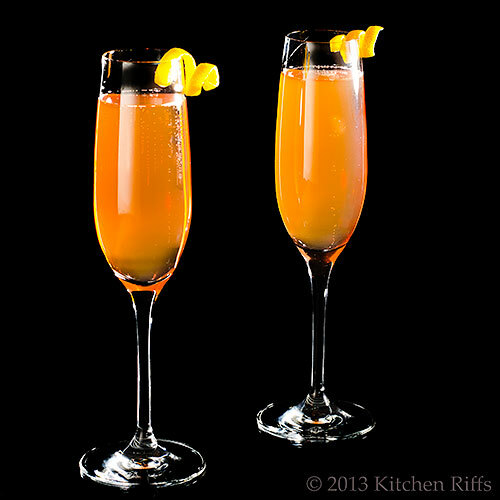 The Seelbach was invented around 1917 as the signature cocktail of the Seelbach Hotel in Louisville, Kentucky. Rumor has it that F. Scott Fitzgerald hung out at the hotel bar while writing The Great Gatsby (remember, Daisy Buchanan hailed from Louisville). And that Gatsby character? He may have been inspired by a gangster Fitzgerald met there—presumably while enjoying this flavorful elixir. True story? Who knows? What we do know is that sometime during Prohibition (when the hotel was forced to close its bar), the recipe for this drink was lost. Then a hotel manager rediscovered it in 1995. Lucky for us. Because on Kitchen Riffs this year, we’ll be doing nothing but cookies and cocktails from now until Christmas. As a bonus, all the cocktails will be made with champagne (or sparkling wine, to be more precise). In addition to bourbon and sparkling wine, you need Cointreau (or another triple sec) and two different bitters for this drink: Angostura and Peychaud’s Bitters. You can find Angostura bitters at any liquor store and many supermarkets. You may have to hunt for Peychaud’s Bitters, though a good liquor store will carry them. Cocktails are better when made with quality ingredients, but you needn’t go overboard on the bubbly. Any decent sparkling wine (preferably a brut or dry Spanish cava) will work fine. More about bubbly choices in the Notes. We have Gary and Mardee Regan to thank for the Seelbach recipe. That’s because, when the folks at the Seelbach Hotel rediscovered it in 1995, they originally wanted to keep it secret. Gary and Mardee Regan were the ones who persuaded them to share it. 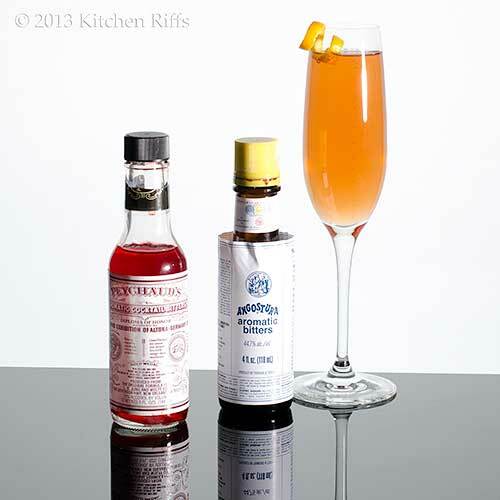 In 1997, the Regans published the recipe for the Seelbach in New Classic Cocktails. You don’t really mix this drink. Instead, you “build” it. That is, you add the ingredients—in the order specified—to a champagne flute. The order for adding ingredients is: bourbon, then Cointreau, then dashes of Angostura and Peychaud’s bitters. Then you carefully pour in the sparkling wine. Add an orange or lemon twist for garnish, and serve. There’s a version of this recipe that uses ¾ ounce of bourbon (instead of 1 ounce as specified in this recipe) and 4 ounces of sparkling wine (instead of 5). I don’t discern much difference between the two versions, but you might. I usually don’t measure the amount of sparkling wine when I make this drink—I just pour until the glass is pleasantly full. But that comes pretty close to the 5 ounces specified. Cointreau is the original “triple sec”—and it’s expensive. You can substitute a less costly generic brand (the bottle will probably just say triple sec). The flavor won’t be as good, but it should work OK in this drink. According to the Regans, the original recipe for this drink specified Old Forester bourbon and Korbel Brut sparkling wine. But any full-bodied bourbon will work fine. My current preference is Buffalo Trace, though any name-brand bourbon should be OK. Likewise any decent (inexpensive) sparkling wine. Champagne gets its characteristic bubbles because it undergoes secondary fermentation in the bottle—a technique called “méthode champenoise.” By European law, that wording can now be used only to describe sparkling wine produced in the Champagne region. Other sparkling wines made in the same way must use the nomenclature “méthode traditionnelle” or “fermented in the bottle,” or the equivalent. It’s difficult to find true champagne in the US for under $30 a bottle. But most of the decent sparkling wines made in the US (and all the cavas made in Spain) are fermented in the bottle. Many of these sparklers rival champagne in flavor. For this drink, Korbel brut is fine, and that’s usually priced in the lower teens. Domaine Ste.-Michelle is another decent (and modestly priced) domestic brand. Spanish cavas can be even less expensive, often selling in the $8 to $9 range. Cordorniu and/or Freixenet can be found in most grocery stores. My favorite un-champagne in this price range is Saint-Hilaire (the full name is Saint-Hilaire, Blanquette de Limoux), which is made in a Benedictine Abbey in southwestern France. This wine actually predates champagne and is in fact France’s oldest sparkling wine. Thomas Jefferson loved it, and served it to guests when he was president. It typically costs $13 or $14 in the US (though friends tell us it can be had for $10 at Costco). Lots of options here. My advice? Just drop by your local wine store and tell them you need “champagne” for cocktails, then ask what they recommend in the $10-or-so range. They’ll usually have several good suggestions. “Is it true that Fitzgerald drank these at the Seelbach Hotel?” asked Mrs Kitchen Riffs, sipping her cocktail. “Perfect for our cookies-and-cocktails series,” said Mrs K R.
“I knew you’d see it that way, old sport,” said Mrs K R, raising her glass. I DO love champagne as well as bourbon so this is right up my alley! Hi Ashely, this is really an interesting cocktail. The bitters give it an almost spicy flavor (not hot spicy; flavorful spicy). Thanks for the comment. cookies and cocktails? PERFECT. this month is going to be wonderful over here. And what a gorgeous color on that cocktail: really great, thank you. Hi Shannon, cookies and cocktails make such a great combo! And this is a good cocktail - really worth trying. Thanks for the comment. Great history as usual. Love the stories. I may not be able to drink this but I can admire it for sure, it's so beautiful. I did enjoy the Fitzgerald books and that era, so this is a fascinating post for me. Thanks John! The color of this is just gorgeous and such an interesting history. You have really opened my eyes up to the rich history of many cocktails. I had no idea! i daresay this cocktail would be awesome with some chocolate orange cookies. But I just can't help imagining how fun it would be to write a novel while sitting in a hotel bar. Gorgeous colors in this drink! Hi Nazneen, cocktail history is so satisfying on its own! Of course drinking the little beauties is nice, too. ;-) Thanks for the comment. Hi Chris, this is a great cocktail, so it's truly hard to believe the recipe was forgotten! Thanks for the comment. Hi Marta, this is such a fun cocktail - worth trying. Thanks for your kind words, and comment. Hi Nee, always happy to be known as the cocktail guy! This one really is worth putting on your list - I think you'll enjoy it. Thanks for the comment. Hi Abbe, this actually is a terrific combo with chocolate orange cookies! Ask me how I know. ;-) And I agree the color is so great. Thanks for the comment. Bourbon and Champagne! The addition of bourbon might actually convince me to drink more champagne. Great cocktail once again John. Hi Amanda, one can never drink too much champagne. Never! Thanks for the comment. Hi Kumar, it's a totally terrific drink! Really super flavor. Thanks for the comment. It brightens up the holidays and New Year as well, John! It is gorgeous! John, such gorgeous ingredients! And the photography, wow! Thank you for sharing. Hi Denise, anything with Champagne does brighten me up, I must admit. ;-) Thanks for the comment. Hi Lizzy, isn't this nice? Truly worth trying. Thanks for the kind words, and comment. Hi Ray, if you like bourbon (and Champagne!) this really is a great drink - loads of flavor. Thanks for the comment. Cookies and cocktails...sounds good to me :) Beautifully done! I'm not positive but I think tomorrow is the anniversary of the repeal of Prohibition! I just may celebrate with this drink. The thought of Bourbon and Champagne is just to difficult to resist! Gorgeous shots John and I adore the sip of usual history too. It's so hard to swallow that such a drink could get lost and then be revived. You just have to love it by celebrating with the Seelback Cocktail and at least one of your Orange Dark Chocolate Cookies! Thanks for sharing, John. Cheers to you and Mrs. K.R! I'm loving this cookie and cocktail series! The cocktail is new for me. I've never had the combination of sparkling wine and bourbon. In fact, the warning in college was not to mix, but then we were talking quantity back then, not quality. 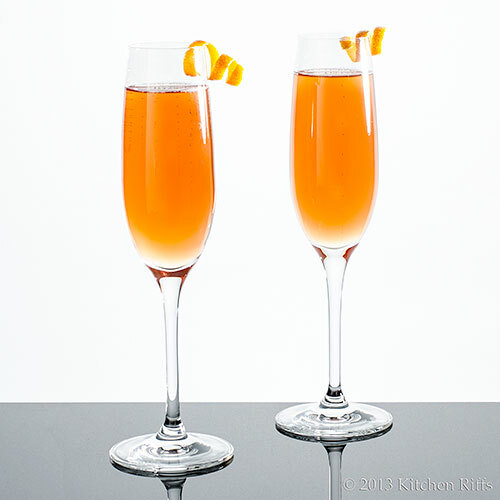 :) This Seelbach cocktail is definitely quality and such a pretty color! Now I have another bitters to find. Thanks John! Champagne AND bourbon? Where have you been all my life? Yes, please. Hi Liz, two of my favorite things! Thanks for the comment. Hi Louise, the repeal of Prohibition should be a national holiday! I agree it's hard to believe this recipe would get lost - but it's true. You don't actually find the recipe in all that many drinks books. Thanks for the comment. Hi MJ, I think it's the quantity thing that gets most people, not the combining thing. ;-) If all else fails on the Peychaud bitters, you can get them online somewhere - but if you local liquor store doesn't carry them (not all do), shame them into it! Thanks for the comment. Hi Pamela, you like bourbon, I take it? ;-) You'll love this - trust me. Thanks for the comment. Wow! John! This is exactly what we need for our Christmas and NY celebration! Hi Zoe, it would be perfect for that! Enjoy. ;-) Thanks for the comment. Love getting introduced to new cocktails I'm unfamiliar with - thanks! and awesome photos!! Some gorgeous cocktails come out of your kitchen. I look forward to the champagne and cookies. I am going to unsubscribe but don’t worry, I have added you on Bloglovin. I am trying to keep my emails clear but will read your posts through Bloglovin as I really love them. My husband is a bourbon drinker and I prefer champagne. This sounds like a good compromise for us. ;) Thanks for the recipe John! I think this is my new Christmas favorite! A festive drink! I love its color. Cookies and Cocktails?! I'm in! These Seelbachs look perfect; every good libation has a story behind it. Great post, John! Wow John that photo is stunning and I can even see the bubbles in that last one. OK I need to have you and Mrs. KR come over and teach me how to take photos. I'm struggling so much with this. I know it's easy but I think because I have so much on my plate I'm not devoting enough time to it. At any rate, although I don't know what 1/2 the ingredients are in this drink it looks delicious and does sound quite tasty. I may have to try this. Hi Allyssa, isn't this a nice drink? Very enjoyable. Thanks for your kind words, and comment. Hi Carolyn, this is indeed a party in a glass! Wonderful for New Year's, or any time you're feeling festive. ;-) Thanks for the comment. Hi Suzanne, I've heard good things about Bloglovin! I'm really email-oriented so that's always my first choice for subscribing, but everyone is different. Thanks for the comment. Hi Nami, when you build a drink it sort of mixes itself automatically! It's just that there's no need to violently shake it or stir it to combine the ingredients. Most cocktails you mix in a separate glass, then pour into the drinking glass. When you "build" a drink, you put all the ingredients in the glass you'll be drinking from. Thanks for the comment. Hi Charlie, there was a reason they called it the Roaring 20's! If you like bourbon you'll probably like this drink. I sure do! Thanks for the comment. Hi Anne, this drink is perfect - something for both of you! ;-) Thanks for the comment. Hi Maureen, you'll like it! It has a distinctive, but pleasant, flavor. Thanks for the comment. Hi Rosa, isn't the color great? I love photographing cocktails just for the colors! Thanks for the comment. Hi Dan, aren't the stories associated with cocktails so interesting? It's the stories that got me first interested in them (I used to drink only wine or beer). Thanks for the comment. Hi VIcki, actually food photography isn't easy at all - food photographers bring in big bucks because it's difficult to do right. In your case, use that tripod I've been telling you about! I almost always use a tripod. Set the ISO to 100 or 200. Since you use natural light or room light, take a custom white balance reading (your camera manual tells you how to do this). Set the camera to aperture priority, and set the camera to f5.6 (you're shooting with a fairly small sensor so that will give you tons of depth of field). Then let the camera select the speed - you'll probably be at 1/4 second or so, but that's OK since you're using a tripod. Try to light from 10 or 11 o'clock (or 1 or 2), and use a white foamcore board (or poster board) opposite the main light to fill. That's the "recipe" but it takes a lot of practice! Later you can work on shallow depth of field if that's what you want, but the first step is to get things lighted properly and in focus. Thanks for the comment. Great idea for the festive period. Love the story, so interesting. An incredibly beautiful cocktail, stunning. I love whiskey and I'm definitely putting it on my holiday cocktail list. Gorgeous. I really do love both bourbon and champagne, so I can't wait to try this drink! Hi Caroline, anything with bubbly is always festive, isn't it? ;-) Thanks for the comment. Hi Asha, I do like the way this cocktail looks! Although I like the way most of them look. ;-) Thanks for the comment. Hi Laura, isn't this nice? 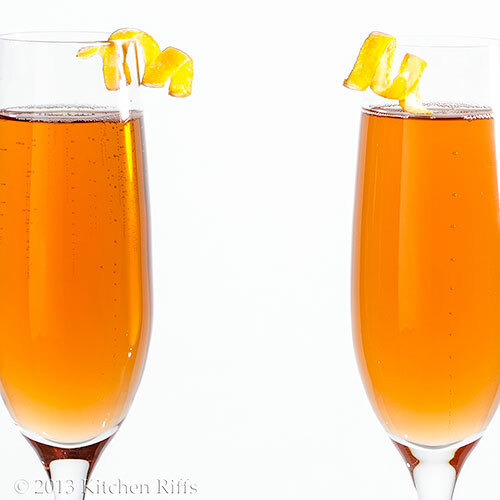 Champagne and bourbon make a terrific combo! Thanks for the comment. We have recently started appreciating bourbon! Thanks for the cocktail recipe! Wow, this sounds so refreshing, I'd love to try this one. Bourbon, triple sec and champagne.. it would be very refreshing. I've actually never tried a drink that had bitters in it, this is very intriguing! I am such a champagne girl, and Ryan has a soft spot for bourbon. This might be the drink we make to ring in the new year! Thank you for sharing John! Hi Sprinkles and Sauce, if you like bourbon, this is a great drink! Thanks for the comment. Hi Barbara, bitters add a lot of flavor to drinks - think of them as seasoning. I love 'em! Thanks for the comment. Hi Monet, this sounds like the perfect drink for the two of you! Enjoy. ;-) Thanks for the comment. What an exciting looking champagne cocktail! I have never seen bourbon and champagne together before... I am sure it would do a job on me, champagne gives me the giggles on its own :0! Hi John, awesome cocktail. You're an expert for cocktail drinks. Always admire your photography skill, very impressive photos. Keep up the good job. Hi Julie, bourbon and champagne isn't a common combo, but it sure works! Giggles guaranteed. ;-) Thanks for the comment. Hi Julia, glad you like the stories and the pictures! Thanks for that very kind comment. Hi Amelia, gosh, thanks for those kind words. And for commenting! i love orangy cointreau all the way! Hi Dedy, isn't Cointreau great? And champagne isn't too shabby either! Thanks for the comment. The photos in this post are so beautiful and elegant! Happy holidays to you! Hi Pamela, thanks so much for those very kind words, and for taking time to comment! Hi Dawn, it's a pretty drink, isn't it? This one is worth having. ;-) Thanks for the comment. Hi Bam, orange curls? I wrap them around a chop stick. Seriously! Wrap and hold for a couple of seconds, and you're good to go. I do know you have access to tons of chop sticks! Thanks for the comment. Love the cocktail, love the story behind it and love the presentation! Hi Daniela, isn't this a nice cocktail? Love its flavor! Thanks for the kind words, and for taking time to comment. Love your literary slant here. Can't wait for the Hemingway cocktail. (These are two of my favorite authors.) We like our Buffalo Trace as well. Great post! Hi Debra, glad you enjoyed this! Fitzgerald, and especially Hemingway, do have lots of cocktail history (or maybe I should say experiences) associated with them. ;-) Thanks for the comment. I have a sister-in-law who adores champagne cocktails, and the husband loves bourbon. I could make three people happy (had to include myself) with this festive drink! Hi Kristi, this really is a nice drink - a bit of a different flavor. But a pleasant flavor! And making 3 people happy all at once? Score! Thanks for the comment. This sounds like the most fantastic flavor combination ever! Hi Candy, it's really a lovely drink - well worth trying! Thanks for the comment. Hi Terra, I think this drink has your name on it. ;-) Really good stuff - thanks for your comment. Hi Kristi, it really is a great drink! Looks pretty, too. ;-) Thanks for the comment. This sounds like a wonderful drink for the holidays!! Hi Dawn, it a super drink! Good anytime, but really nice for the holidays. Thanks for the comment. Hi Sowmya, bourbon has such great flavor, doesn't it? Goes great in this cocktail! Thanks for the comment.